The 3G Motorola E1060 can basically be seen as the little brother to the E1120 and is also scheduled for a Q4 2005 launch. Despite the wacky looks, the E1060 can be seen as a fairly minor upgrade to the existing E1000 series. It's a sleeker looking handset than the E1000, and it comes with a 1.3 megapixel camera. The other core specifications of the Motorola E1060 are in line with other similar Motorola handsets, with Bluetooth support, TransFlash expandable memory (up to 512Mb), MP3 and RealPlayer audio and various video playback formats, a web browser and email client and two-way video calling using the inbuilt VGA resolution secondary camera. The E1060 also features Motorola's new "Dynamic Idle" service where the handset will receive and display news items of interest automatically. There's nothing in the Motorola E1060 that we haven't seen elsewhere, and really it's just a progressive upgrade of the older E1000, so hopefully Motorola might be able to meet the Q4 launch date they've set themselves. 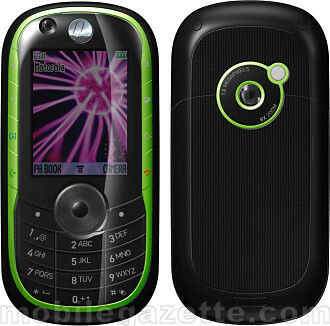 The Motorola E1060 is a competent handset and a useful addition to Motorola's ever expanding range of 3G handset.